Todd Landman, Professor of Political Science and Pro Vice Chancellor of the Faculty of Social Sciences, looks at President Trump’s first year in office. Saturday 20 January 2018 marks the first anniversary of the inauguration of Donald Trump as the 45th President of the United States of America. For many, this seems like it has been a very long year indeed. One that began before his surprise victory in November 2016 and one that includes a flurry of daily news coverage of announcements, gaffes, insults, blunders, and comments that make the most seasoned of commentators scratch their head in bemused wonder. One reading of the first year would see the President as the ‘great disruptor’, who came to power in unorthodox fashion, took the reins of government, and lived up to almost every promise he made in the campaign. He has been hard on immigration, environmental protection, universal healthcare, and ‘foreign entanglements’, where he has torn up the rule book of domestic and foreign policy making and pursued his vision of Making America Great Again. He has been soft on corporate America with a very generous tax reform and has used his power of the pardon on Former Sheriff Joseph Arpaio from Arizona, who was convicted for racist profiling. Another reading sees a President at sea with no real understanding of world politics, the nuance and sensibility required for superpower leadership, basic American constitutionalism, or any notion of equality, diversity, and inclusion. He has shouted his way into Washington and other world capitals, spouting (and tweeting) anything that comes into his mind in a fit of spontaneous vitriol that offended in one way or another everyone apart from his very loyal base of supporters. His contempt for women’s rights, refugee rights, civil rights, and equality before the law has left deep divisions in an already divided America. The 55-minute live broadcast of immigration policy discussion in the White House revealed a President that does not understand how bills are formulated and passed through Congress, while his early morning tweets have earned him the label of social media troll. These two portraits of the President are framed by a merry-go-round of exits from his cabinet and White House Team, the methodical investigation of Special Counsel Robert Mueller, and an array of breathless media organisations that have been berated for their constant production of ‘Fake News’. Many of the top team who led Trump to victory such as Michael Flynn, Paul Manafort, Reince Preibus, and Steven Bannon have all now left the White House, and have been joined by lesser players such as George Popadopolous, Anthony ‘The Mooch’ Scaramucci, and Sean Spicer. Trump attacked Jon Sopel from the BBC and continuously attacks CNN, the number one enemy of his favourite channel Fox News. He stands in the middle of this maelstrom and proudly announces that he has achieved more than any other President in history. The quiet determination of Robert Mueller, however, is the key thing to watch in 2018. His appointment was in many ways a result of Trump’s firing of FBI Director James Comey and the recusal of his Attorney General Jeff Sessions. Trump’s efforts at containing the Russia investigation backfired spectacularly with the Mueller appointment. Like Elliot Ness pursuing Al Capone, Mueller is building a well-documented and meticulous case that includes financial dealings, business connections in Russia and the Former Soviet Republics, and evidence of that many in his team engaged in activities that are not only illegal, but that also may have compromised the President himself. The long year of Trump ended with the publication of Michael Wolff’s Fire and Fury. Spun from over 200 interviews with the members of the Trump team, the book provides a badly written and questionable portrait of a hapless and reluctant president that many insiders say more or less ‘rings true’. The publication of the book along with a new low even for this President in making horrendous comments about Haiti, El Salvador, and countries in Africa means that the president still enjoys near record low approval ratings and a growing movement to unseat him. No doubt 2018 will bring more revelations about the President’s business dealings and past ‘dangerous liaisons’, while the Midterm elections in November and the conclusion of the Mueller investigation threaten his very hold on power. It will not be an easy ride and may well lead to a vote to impeach, but whatever, the spectacle of Trump will not fade away, and that is exactly what he wants. 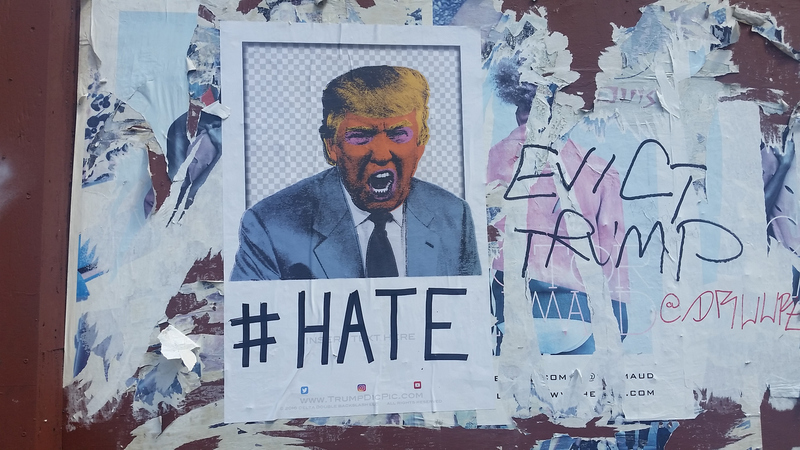 Professor Landman is joined by Christopher Phelps, Associate Professor in the Department of American and Canadian Studies on 7 February for a panel discussion Trump: One Year On. I’m still amazed he is running the most powerful country in the west. I expect to wake up and hear that he’s been thrown out of office for some kind of immoral practice. It’s like the head of Monsanto or General Motors being chosen for a role in ethical climate practice. Why would anyone vote for this man? I know that the other choice wasn’t exactly a noble peace prize candidate but, come one, not a bigoted, right-wing, homophobic failed businessman who inherited wealth through a system of nepotism. There are some Americans who even believe that he was God’s choice for the job. If there is ever a sign that this world is Godless, it’s seeing Donald Trump’s inarticulate ramblings on Twitter.